For many Yemeni students and businesspeople in Germany, the year 2017 began with a nasty surprise. For some time now Deutsche Bank and a series of other credit institutes have been canceling the current accounts of dozens of these individuals, without giving any reason. Yemeni diplomats, all of them Commerzbank customers, have also been affected by the wave of cancellations. “All Yemeni diplomats received the same termination letter from the Commerzbank in mid-October,” Yahia Mohammed Abdullah Al-Shaibi, the Republic of Yemen’s Ambassador to Germany, told DW. Except for the accounts belonging to the Ambassador himself and the Embassy, which expired on March 15, all accounts were terminated by Commerzbank on December 15. According to Al-Shaibi, Yemeni representations in other European countries and diplomats representing other countries in Germany are not affected. 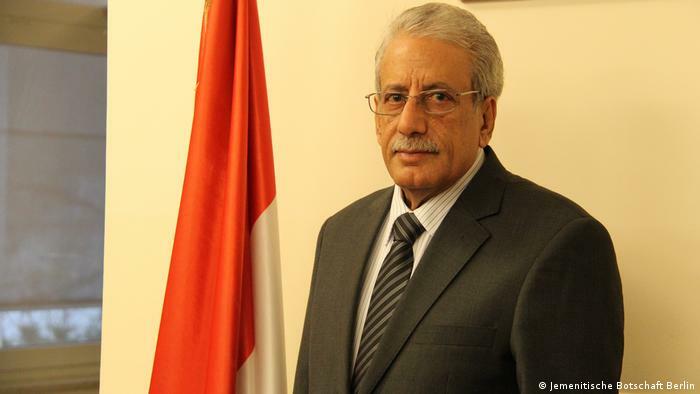 The cancellations have not only caused “great difficulties” for Yemeni diplomats, Al-Shaibi continued. Yemeni students and businesspeople have also been adversely affected by the move. Al-Shaibi, the most senior Yemeni diplomat in Germany since September 2016, emphasized that business relations with the Commerzbank have already been in place for two decades. There had been no problems until October last year, he said. When approached by DW for a response, the Commerzbank replied that they are allowed to cancel accounts “without giving any reasons”. The bank was not prepared to make any further comment on the issue. Like that of the Commerzbank, the Deutsche Bank cancellation letter also referred to prevailing contractual freedom in Germany which states that service providers such as banks – as well as customers – have the right to terminate accounts without giving any reason. After conducting a Facebook group poll, Abdulhameed Al-Mahfadi says there are at least 74 cases of accounts being cancelled. According to the responses to this poll, all those affected received a similarly formulated termination letter over a period between the summer of 2016 and the end of January this year. DW has seen four such termination letters from the Deutsche Bank. Most of the accounts were cancelled in the latter half of January, and cannot be used after the end of March when the two-month notice period expires. Al-Mahfadi says that following the cancellation of his account, no other bank has been willing to open another in his name. The only exceptions are the Sparkasse Hanover and the Turkish-Kuwaiti KT Bank headquartered in Berlin. Just as in the case of the diplomats, the student representative says the move has not affected Yemenis in other European countries or students of other nationalities. This explains why many Yemeni students feel discriminated against and placed under general suspicion, says Al-Mahfadi. “Most of our students are afraid that they’ll be given a hard time socially and by other banks. That’s why many of them didn’t take part in the poll,” says the 24-year-old student. In 2013 during the nuclear standoff with Iran, the accounts of more than 2,000 Iranian students in Germany, Austria and the Czech Republic were frozen. Most of them were customers at the Commerzbank, the Deutsche Bank and the HypoVereinsbank. This is a large number in comparison to the fewer than 100 known Yemeni cases, but then far more Iranian nationals live in Germany than Yemenis (c. 70,000 as opposed to 2,000). And at the time, Iranian diplomats were not affected. In an interview with DW, Omid Nouripour, foreign policy spokesman for the Green Party in the Bundestag expressed indignation at the cancellations. “If people are losing their accounts just because they come from a particular country, then that’s simply discrimination. The government has to make this unequivocally clear to the banks,” he said. Nouripour has announced his intention to contact the government over the matter. When Ambassador Al-Shaibi turned to the German Foreign Ministry directly following the cancellations in October, the ministry expressed surprise and assured him that the decision had not been taken by any government authority. The German foreign Ministry has promised to review the situation and referred Al-Shaibi to other banks such as the Sparkasse. But, says the Ambassador, not a single Sparkasse bank was willing to open accounts for Yemeni diplomats. On paper at least, this procedure is legal in the case of private banks in Germany, which are not obliged to grant new account applications. But in the case of the Berliner Sparkasse, a state-owned lender, things look rather different. The cancellations prompt a host of controversial questions: What is the reason for the wave of cancellations across the banking sector? Do the banks know which Yemenis have had their accounts terminated, as well as when and why? And why has the move only apparently targeted Yemenis? One possible explanation could come from enhanced due diligence obligations in the banking sector in the case of what are termed “politically exposed persons” (PeP) such as diplomats, as well as a heightened risk of money laundering and terrorism funding from certain countries. Information on this is provided by, among other sources, the country lists of the supranational Financial Action Task Force (FATF), which the Federal Financial Supervisory Authority (BaFin) distributes to the German banks under its supervision. 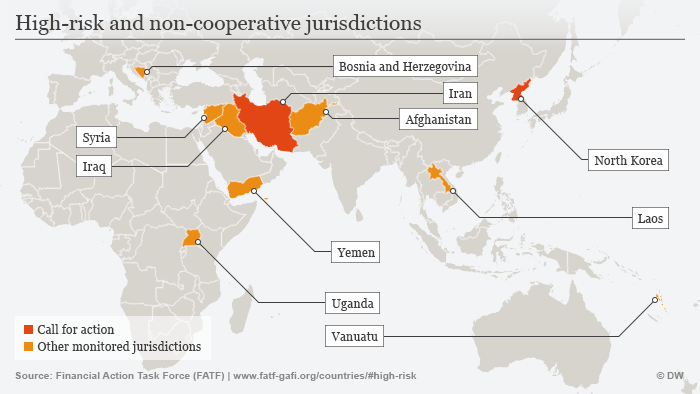 The FATF currently views Yemen as a “high risk and non-cooperative jurisdiction”. Nine other nations are on the FATF “black list”, among them North Korea, Iran and Syria. The current risk assessment of Yemen by the FATF issued last October does however state that Yemen has made “progress” since 2010 in its efforts to counter money laundering and the financing of terrorism. In a separate circular from May 2016, BaFin instructed German banks to “give appropriate consideration to the situation in the nations named and persons from those nations respectively” when appraising country risks. But as the BaFin also told DW, originating from a “high-risk nation” meant neither the automatic “presence of a suspicious case” nor that an account owned by the person concerned “should be automatically cancelled.” What is significant is the “individual risk situation in consideration of all circumstances of the individual case.” In other words: An enhanced risk does not justify the unfounded termination of individual customer relationships, and certainly not those of all citizens of a particular nation. Based on this information at least, it appears doubtful that all the aforementioned banks would have simultaneously given Yemen a poorer rating in their risk evaluation process and that this is why they cancelled accounts and refused new applications. But there are indications that the cancellations fall within the area of “risk minimization measures”. One of these is the currently heightened uncertainty and risk-averse approach among banks due to negative PR and financial penalties. In particular the Deutsche Bank, Germany’s largest credit institute, recently had to pay huge fines in the US for failings in its money laundering safeguards. But this also doesn’t address the apparent singling out of Yemeni citizens. What about the applications rejected following the initial cancellations – despite banking secrecy laws do banks in Germany have access to information on people who have had their accounts cancelled, and when and why this happened? Thus far, none of this has done anything to help most affected Yemenis, who continue to face the daily challenges of managing their lives without a bank account.